Chelsea Miller is RSB’s Fund Development Associate. 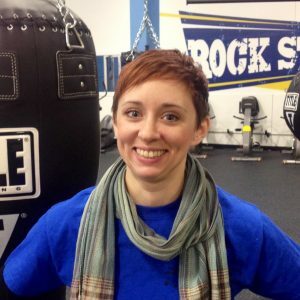 She has a passion for boxing and physical fitness and especially on the positive benefits fitness has on people’s lives. Chelsea has been with Rock Steady since February 2014. She started as an Administrative Assistant, but has also worked as Affiliate Services Manager and in donor services at RSB. Starting in May 2018, she began working exclusively in donor services as Fund Development Associate. She resides in Indianapolis, IN and enjoys bike rides on the Monon Trail, hanging out with her baby boy Charlie, husband Ben and bulldog Louie.